I read this article and found it very interesting, thought it might be something for you. The article is called Radical Women’s open letter endorsing Steve Hoffman and is located at https://votesocialism.com/radical-womens-open-letter-endorsing-steve-hoffman/. Radical Women is proud to support Steve Hoffman’s campaign for U.S. Senate as a representative of our sister organization, the Freedom Socialist Party. We urge all feminist activists and groups to endorse and promote the election of this long-time socialist feminist organizer. Steve is a tenacious fighter for women’s rights and all working-class and poor people. 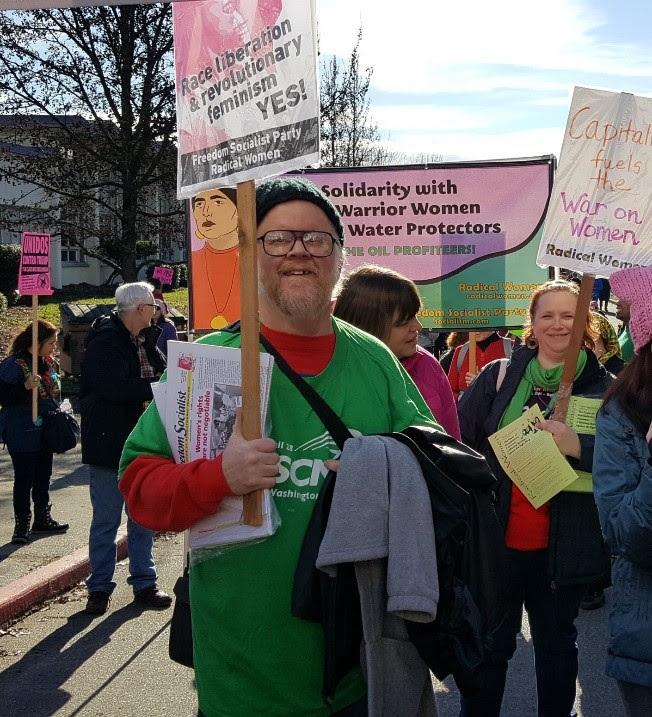 He is a union shop steward and recording secretary for Washington Federation of State Employees Local 304, who defends every working person who is abused, on the job or off. A facilities technician at North Seattle College, he is challenging big-business representative Maria Cantwell and alt-right leader Joey Gibson. He is an anti-war Navy veteran who champions open borders, affirmative action, equal pay and an end to sexual harassment. Steve has worked closely with Radical Women over the years. He helped build labor support for our Sisters Organize for Survival (SOS) campaign to stop state budget cuts to healthcare, social services, education, and the wages of state workers. Steve initiated rallies by his union to stop the cuts and also supported Radical Women’s demand to tax the wealthy and corporations. As a staunch advocate for reproductive justice, Steve fights for abortion rights as a labor issue and has been on clinic defense lines many times. He mobilizes against the misogynist far-right and defends the rights of immigrant workers. He walks his feminist talk! Please urge your organizations to endorse Steve Hoffman’s campaign and invite him to speak. Contact the campaign to make arrangements: 206-722-2453, VoteSocialism@gmail.com. This community-powered campaign also needs you! Volunteer nights happen every Wednesday from 6:00-8:00 pm at Advocates for Hoffman Headquarters, New Freeway Hall, 5018 Rainier Ave. S., Seattle, WA 98118. 6:00 p.m. – 8:00 p.m. Pitch in to help reach out to supporters, organize materials, make signs for upcoming actions, and more! Steve’s street-heat campaign depends on grassroots donations. Make checks payable to Advocates for Hoffman, and mail to 5018 Rainier Ave. S., Seattle WA 98118 or donate online at VoteSocialism.com. You can stay updated with the Hoffman campaign online at www.VoteSocialism.com and on Facebook at Advocates4Hoffman. Visit the website to see Steve’s platform, sign up on the mailing list, and check out volunteer and donor opportunities.